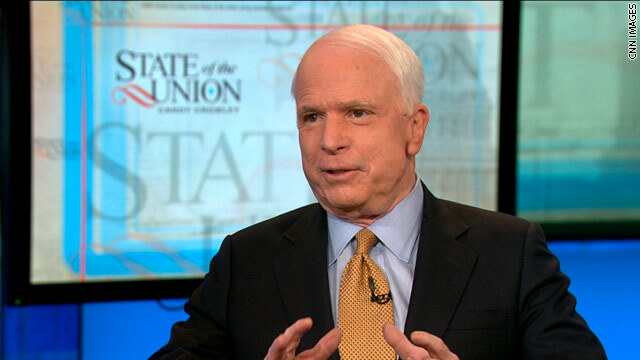 Washington (CNN) - Republican Sen. John McCain of Arizona was critical of the president’s timetable for action in Libya, but said he is confident the American military will succeed. The ranking member of the Senate Armed Services Committee said if the United States had acted a couple weeks ago, before the United Nations issued a cease-fire, a no-fly zone “would probably have been enough” to prevent the situation in the African country from deteriorating. American, French and British military forces launched an operation on Gadhafi’s military Saturday, convinced the Libyan leader was not adhering to the U.N.-mandated cease-fire. The attacks on Libyan military positions with missiles and airstrikes are part of an operation that will include enforcement of a no-fly zone. “Now, how quickly we can move back and get him (Gadhafi) out? I think it’s going to be a matter of time,” McCain said. Watch State of the Union with Candy Crowley Sundays at 9am ET. For the latest from State of the Union click here. That's not support McCain, that's sour grapes. Get over your loss, you sound like a child. Are all these people saying we should go into Libya ready for their taxes to go up to pay for it? It's a disgrace we are in two wars and not one dime has been asked for by the American public to pay for it. All the sacrifice has been made by the soldiers and their families. United We Stand...what a joke.